Note: Making your own broth is what Grandma would have done, and it’s more nutritious than the store-bought broth. But if you absolutely need to buy a soup broth, choose high-quality, organic, low sodium. To make “Grandma’s” broth, use organic, grass-fed beef soup bones (or organic chicken). Cover them with cold water and add 2 tablespoons of apple cider vinegar. Store it in the fridge for 2 hours (or overnight) to help release more beneficial minerals. 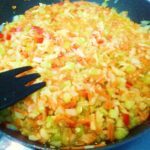 After the 2 hours have passed (or the next day), add the roughly chopped vegetables: 1 onion, 1 carrot, 1 parsnip, 1 celeriac. Add enough cold water to cover the bones and veggies, then add some salt, dill, and parsley for flavour. Simmer covered for minimum 2 hours (or pressure-cook), then let the broth cool. Note: A stainless steel pressure cooker is a great for making the broth, as it retains more vitamins, reduces cooking time to under an hour, and limits water evaporation. To make “Grandma’s” Soup: Using a colander or a sieve, strain the broth into a large soup pot, add 1 or 2 litres of water, and set the heat to medium. Sauté 2 finely chopped onions in a pan with 2 tbsps. of butter (or coconut oil) and 2 tbsps. of water. Keep the temperature low and the pan covered. Stir frequently and add more water as it evaporates. The onion will be translucent and softened after a few minutes. 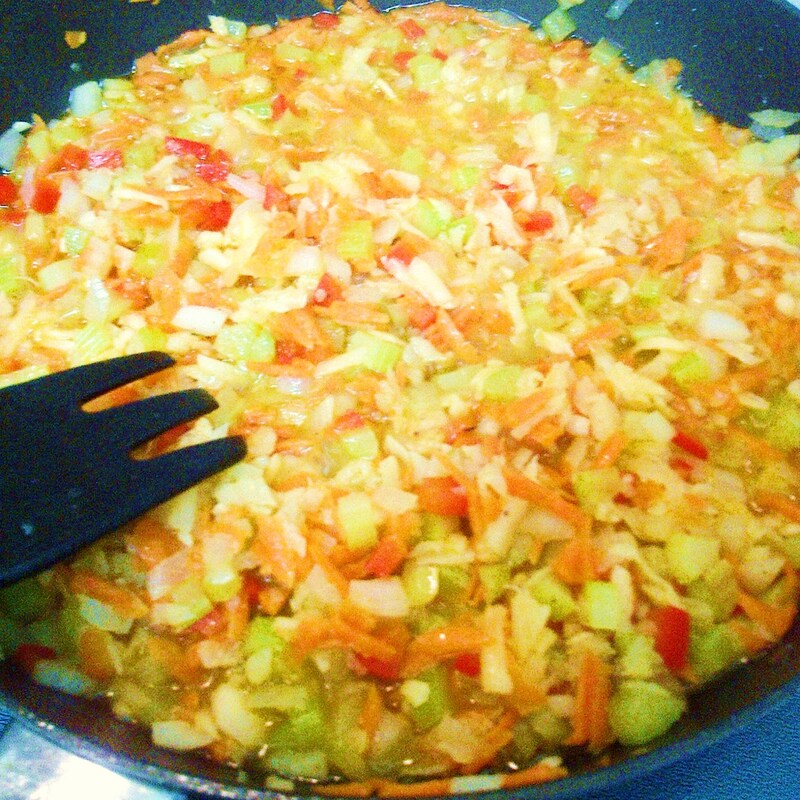 In the meantime, finely chop the carrots, parsnips, celery sticks, the red bell pepper, and the garlic, and add them to the pan. (A shredder can speed up the preparation.) Cook them for a few more minutes covered, stir frequently, and add more water if needed. When lightly softened, add them over the hot broth. Peel the potatoes or the squash, cut in bite-sized cubes, and add them to the pot. Then chop and add the tomatoes, too. If you happen to have some, a handful of chopped green beans, some broccoli or cauliflower florets can be added as well. Adjust for taste with salt and pepper. To make the meatballs: Mix the ground meat with 1 finely chopped onion, 1 beaten egg, finely chopped dill, 1 tbsp. of flour, and ½ cup of rice or quinoa. Add a dash of salt and pepper. Reduce the heat to low and make sure the soup is not boiling at this point, to prevent damaging the shape of the dumplings when you add them to the soup. Using 2 spoons, form small dumplings and drop them gently in the soup one by one. After all the dumplings are added to the soup, increase the temperature to medium. Cook for about 30 minutes, stirring a couple of times. Finely chop the dill and the parsley and squeeze the lime juice. Add them last to the soup and then turn off the heat. Leave it covered with a lid for a couple of minutes, and then cool it down fast in the sink, immersed in cold water. Refrigerate as soon as possible, and even freeze a few portions for later use. Enjoy Grandma’s lovely and nutritious soup! … And if you want the real, European, traditional experience, then you may want to add a teaspoon of sour cream in your bowl of soup before you eat it. Note: To lower the soup’s starch content and lower its glycemic load, use squash or zucchini instead of potatoes, and quinoa instead of the rice for the meatballs. Our goal is to teach our patients to take responsibility for their health in a positive atmosphere. @2018 - All Right Reserved. Researched and Developed by Northshore Naturopathic Clinic.